In a large, heavy-bottomed saucepan, sweat onions gently in olive oil, covered and stirring frequently until they are golden brown and very reduced but not too darkened or blackened in any way. This could take a good half hour. When they are a golden brown paste, add garlic and jalapeño pepper, minced together very fine in processor. Add sausage and stir vigorously to break into fine bits and sauté slightly. (You can use ground beef or turkey but not more than half or it won't be as good.) Add Intensely Italian Herbs and ground tomatoes. If you have some good fresh tomatoes, chop them and add as well. Julia Child uses canned ground tomatoes and so should we all, as good fresh ripe ones are so hard to come by in most seasons. Fill one of the cans two thirds full of water and whisk in tomato paste, salt and pepper. Add this to the sauce. Simmer al least 30 minutes, stirring often to prevent sticking. This will make a good gallon of sauce, which is far too much for a single lasagne, so freeze half of it for another day, or better yet, make 2 or 3 lasagne while you're at it and freeze them fully assembled. This sauce can be made meatless for a vegetarian lasagne. Just add your favorite vegetables. Cook lasagne noodles according to package direc­tions. Do not overcook. Drain and rinse with cold water and put back into the pot in cold water while you work. This keeps the noodles separated, and also rinses your fingers each time you grab some noodles. Cover the bottom of a 9 x 1 I baking pan with sauce, then build the layers with noodles, more sauce, and the cheeses: mozzarella and sharp white cheddar, mixed; parmesan, and cottage cheese. Ricotta is great too, and traditional, but I like cottage cheese and it's much easier to work with. Finish top with sauce and mozzarella blend; parmesan on the top will blacken and dry out. Bake at 350° for fifty minutes and dive in. Delicious! Lasagne can be made in many varieties, with or without meat, so don't hesitate to improvise. Keep reading for some ideas to escape from the tomato and cheese theme. With the first October rains on the Pacific Coast, I go slightly mad, abandon everything, and go mushroom hunting. The boletus edulis, or porcini, is abundant for a brief exhilarating time, and I gather for a whole year. Dried or fresh, they add incomparable flavor and richness to sauces, soups, or grains, as in this classic Italian dish. Soak one ounce dried Porcini mushrooms in one cup dry white wine for an hour at least. If you have fresh ones, finely slice about a pound. Slowly brown a large red onion, diced, in 4 Tbsp. olive oil and 2 Tbsp. butter, until limp and golden-brown. If mushrooms are fresh, increase the heat and add them to the onions, tossing to saute rather than stew them. If dried, chop them coarsely, reserving the wine from soaking, and add to the skillet. Add 2 cloves garlic, finely chopped with a handful of Italian parseley. Add 2 cups raw rice, Italian Arborio is best, and saute all together, stirring, for 5 minutes. Add 2 Tbsp. INTENSELY ITALIAN HERBS, the reserved wine, and begin adding warmed chicken stock, stirring constantly, adding more only as it is absorbed by the rice. This will take 3-4 cups of stock, and about 25 minutes. When soft, add 1/2 cup parmesan, a pinch of saffron, salt and fresh ground pepper to taste, and serve immediately. It's a meal in itself or a sumptous side. Lasagne can be made in many varieties, with or without meat, so don't hesitate to improvise. Sweat 2 cleaned and sliced leeks in 2 Tbsp. butter or oil, with one finely-diced carott, 4 sliced mushrooms, and 1 clove minced garlic. Add 1 cup rinsed lentils, 1 Tbsp. 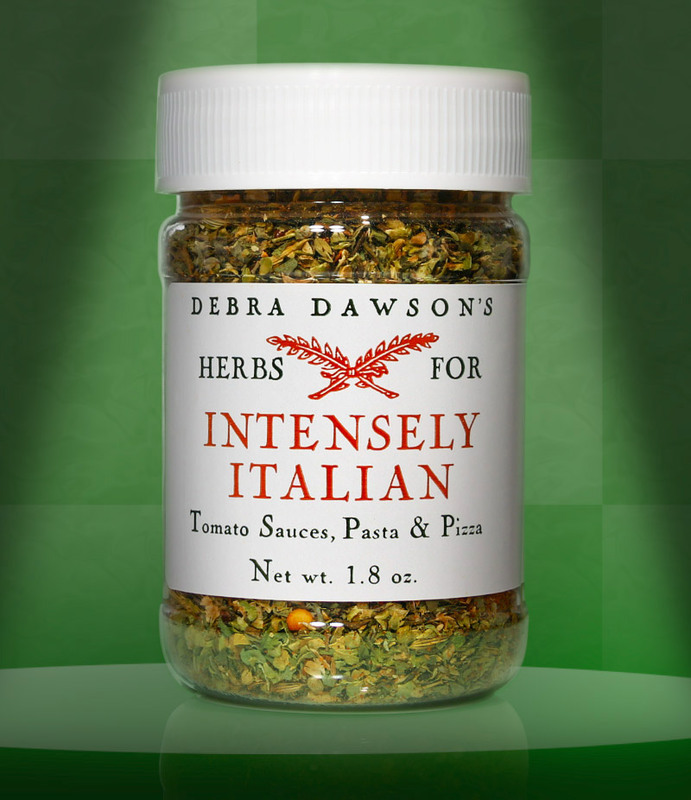 INTENSELY ITALIAN HERBS, and 1 cup chopped tomatoes, fresh or canned. Simmer 1/2 hour, barely covered with water. Salt and pepper to taste, and use as you would tomato sauce, previous pages. Topped with balsamella, this can be cheeseless, or you can layer with your favorite cheeses. Pour some balsamella into the bottom of a pan, then a layer of noodles, a thin, even layer of salmon fillet, a layer of fresh spinach, steamed and squeezed dry, a sprinkle of INTENSELY ITALIAN HERBS, another layer of pasta, and more balsamella. Top with grated Romano. Lasagne with eggplant and capers is a Sicilian classic. The eggplant can be fried, or baked, in thin slices, then layered with fresh pasta (or boiled Lasagne noodles), balsamella, and a simple tomato sauce with capers. It is topped with bread crumbs and balsamella. yum.